It took a little while for Brundle to ask that clarifying question, however, as Dennis apparently likes to dance around this answer almost as much as Button does. “We have Fernando contracted for three years and Jenson contracted for two,” said Dennis on the broadcast. Brundle had to confirm what Dennis was sort of saying in his rambling, roundabout answer for sure, so he interrupted Brundle’s answer to ask point-blank if Dennis had let something slip. “So that’s breaking news — Jenson is driving for McLaren next year?” asked Brundle. Jenson Button has been particularly coy about his plans for 2016, even going so far as to rebuke three-time F1 world champion Niki Lauda for pretending to know what he’s up to next year. Both Button and Alonso have been openly unhappy with the McLaren Honda’s lack of performance this year. Alonso at once point during the Japanese Grand Prix compared the Honda power unit to that of a lower-series GP2 car’s over the team radio. While it would be nice to think that both drivers are sticking around, most fans would love to see the two past world champions in cars that better match their driving abilities. 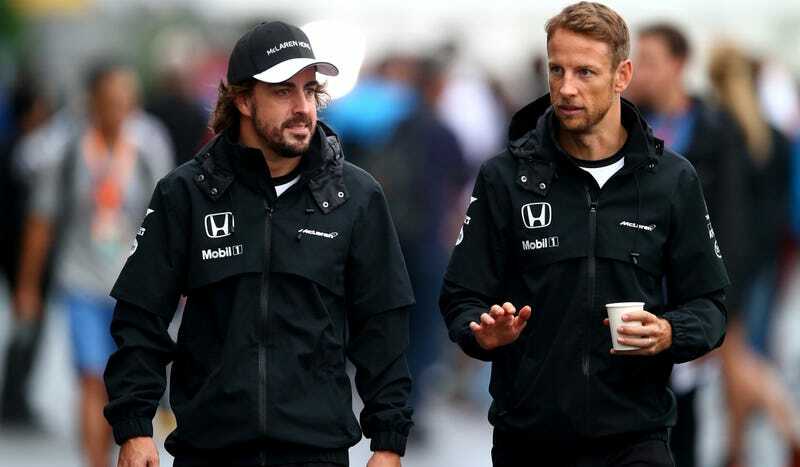 Will both Button and Alonso stay faithful to the contract with McLaren as Dennis thinks they will, or will they look to break that contract in search of greener pastures? Whatever they decide, we’ll find out soon.